"The Path That I Follow". 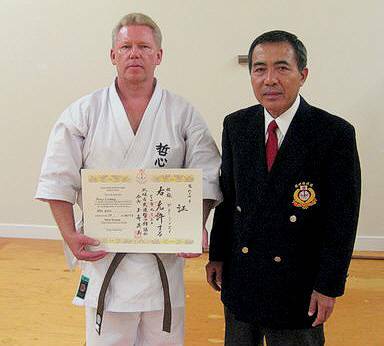 I began my training under Sensei Hidemi Tamayose, 10th Dan, Founder of the Ryukyu Kobudo Tesshinkan in 2001. The first thing that I noticed was that there was clearly a difference in his approach to kobudo compared to the style of kobudo that I had previously practiced for more than 15 years. As such, I decided that in spite of my prior experience that I wanted to enter the Tesshinkan as a beginner. And so, for the first time since 1978, I donned a white belt. I have never once regretted that choice and the day that I receivd my Sho Dan from Sensei Tamayose confirmed for me that I made the right decision. 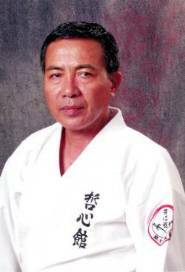 The following link will take you to the "History Page" of the Ryukyu Kobudo Tesshinkan. There you can learn more about the early beginnings of Okinawan Kobudo and my teacher, Sensei Hidemi Tamayose. http://www.kobudo-tesshinkan.eu/History/history-en.php . Remember: "If you always have the curiosity of a beginner, you will never stop learning".